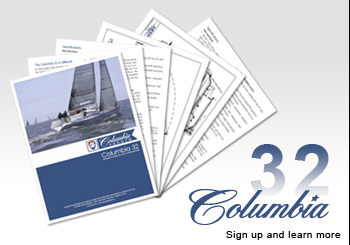 The Columbia Carbon 32 is small enough to be operated by a single handed sailor, and big enough to safely cross oceans with a full crew and log 200–300 mile days! The base boat can be equipped simply as a day-sailer or fully outfitted to meet or exceed stringent offshore sailing regulations. With a Carbon Columbia 32 you can sail at any level. You are only limited by your desire and ability. Custom, 7/8 fractional tapered aluminum mast with backstay flicker. 22” round, Lewmar low profile foredeck hatch.